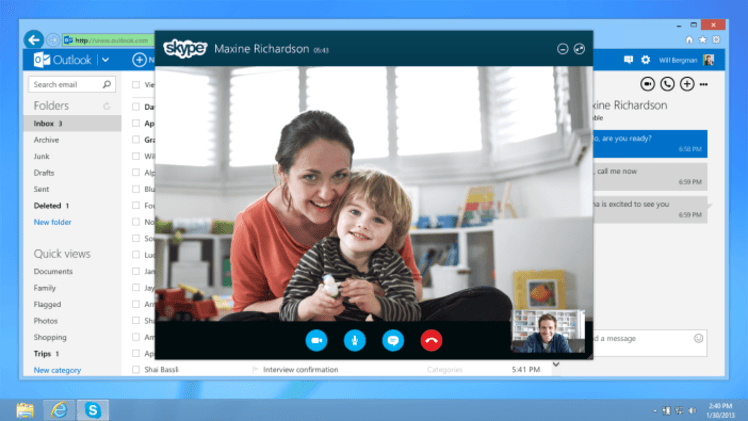 Back in April, Microsoft launched a preview version of Skype for Outlook.com. After reading through the user feedback and making a few updates, Skype for Outlook is now available to all residents of the United States, Canada, United Kingdom, Germany, France and Brazil. According to the official Outlook Blog, the pairing is a match made in heaven. Citing the results of an Ipsos Public Affairs survey, Microsoft explained that 76% of people follow up their email conversations with a phone call, video chat, or in-person meeting. Needless to say, integrating Skype directly into the inboxes of millions of users is an appreciated convenience. To further enhance the user experience, Skype contacts are automatically ported over to your Outlook contact list. Instant messaging should also work as-is; however, a browser plugin must be installed in order to communicate face-to-face. Furthermore, an existing Skype ID isn’t actually needed to access the service; any Microsoft account serves as its equivalent.